Westboro in 1914 was really only 10 years into its transition from a tiny hamlet of cottages and small wood houses to a developing police village. 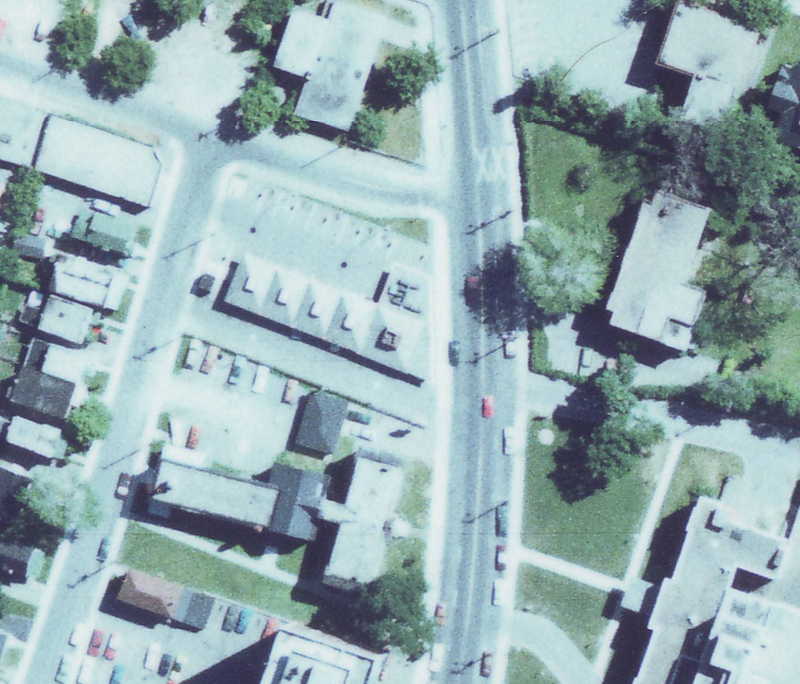 Westboro was still largely a cluster of homes by Richmond Road with a few shops to serve its residents. 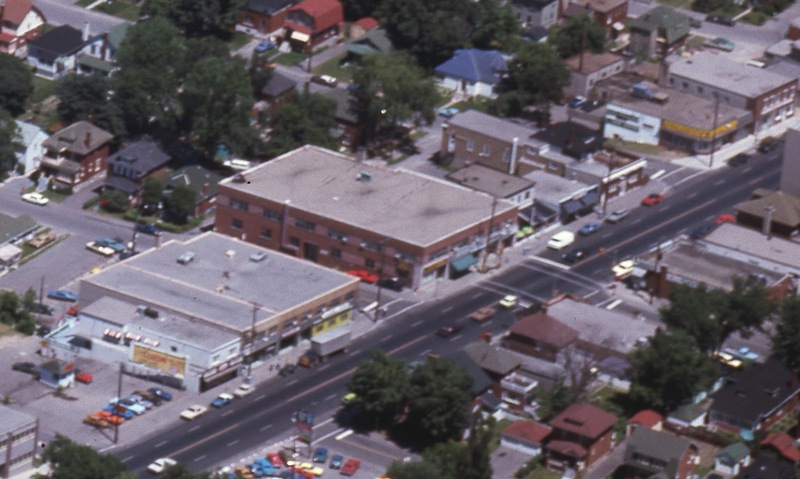 The village was connected to Ottawa via the streetcar, but was really its own little small town, decidedly separate from Hintonburg on the east, and the little cottage communities like Woodroffe to the west. 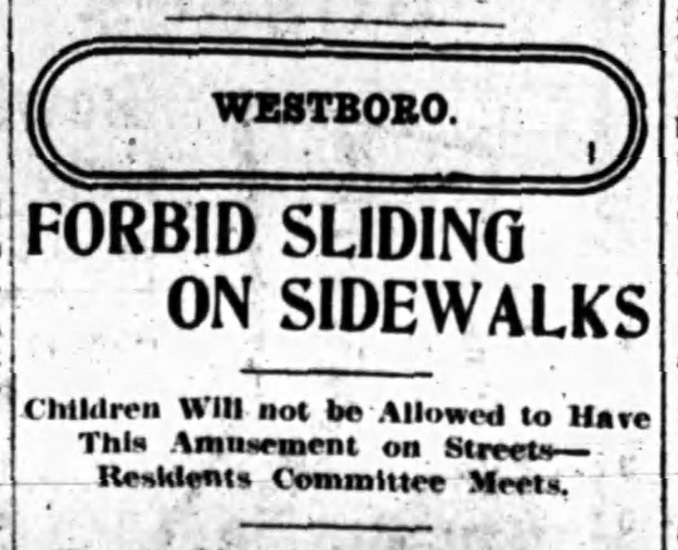 In 1914, Westboro made an attempt to get on the map by constructing a major attraction. 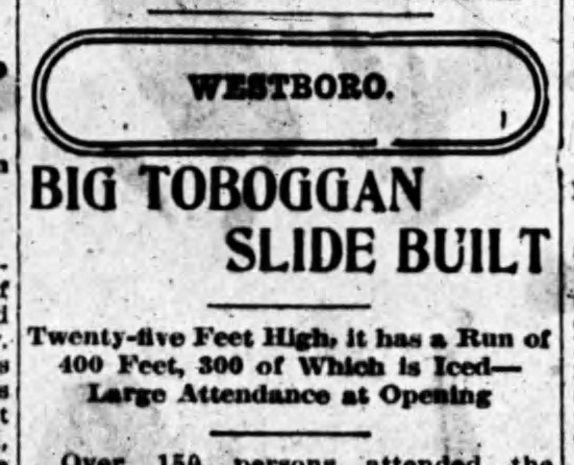 By 1914 standards, a toboggan park was a pretty big deal. But as you'll read, what started off as a good idea got mixed up in politics and profit, and eventually proved unsustainable. For one magic winter, however, the villagers of Westboro had an exciting recreation feature that brought everyone together for some fun and exercise. 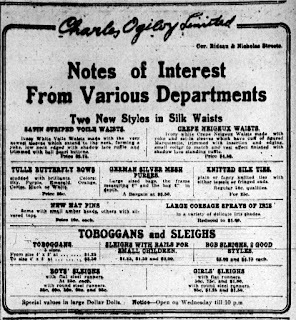 The story begins at the start of winter in mid-December of 1913 when it was determined that children tobogganing down the sidewalks (and street) of Main Street (now Churchill Avenue) from the streetcar tracks (Byron Avenue) to Richmond Road were dangerous and a nuisance. The toboggans left the sidewalk in a slippery and unsafe condition for pedestrians, despite the spreading of sand and ashes on the ice. As well of course, there was danger to the kids in being run over by horses or the few early cars that were on Westboro streets. The town council (Trustee Board) announced that tobogganing on Main would no longer be allowed, and that they would be installing placards to this effect. Trustee C.W. Ross stated "If the placards are disregarded, we will prosecute the offenders if necessary to stamp out the practice of sliding on Main street hill." The threats worked, as the kids moved off Churchill to Eden Avenue "Westboro's young element has shifted the scene of their exercise to a more secluded and safer thoroughfare and now do their "coasting" in the vicinity of Churchill avenue", wrote the Journal. If that sounds confusing, it is...ironically Eden Avenue was originally known as Churchill Avenue. 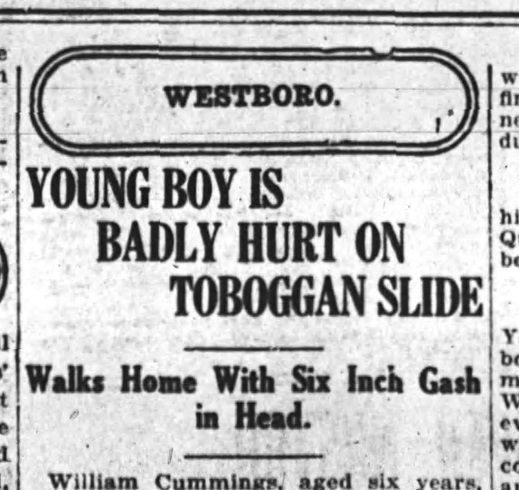 Over the following few days, one of the more popular topics within the village was tobogganing, and how could the activity be enabled in Westboro. 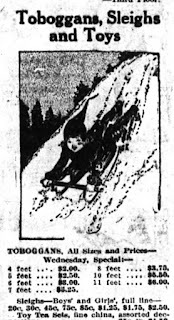 The most popular tobogganing area in Ottawa was in Ottawa South off Sunnyside Avenue, on a spot called "Ray's Hill". 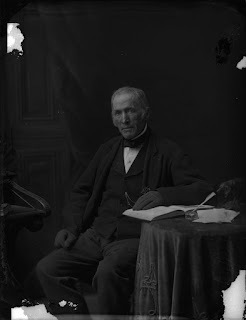 (A little snippet about Ray's Hill can be found in this article posted at the Old Ottawa South website: https://www.oldottawasouth.ca/stories/item/5720-from-the-archives-recollections-by-th-brewer). 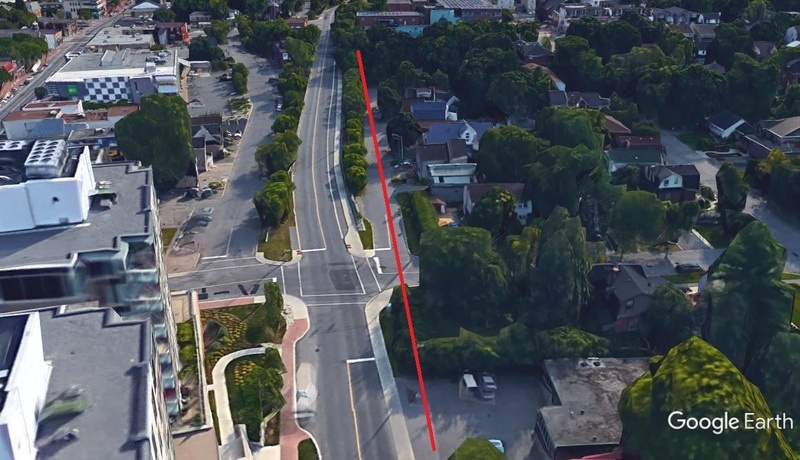 That hill would have been accessible via a fairly long streetcar ride with a transfer at Bank Street, but surely was a rare trip for anyone in Westboro to make at best. There was also a slightly less popular toboggan park, called "Cliffside Slide" near Sussex in Ottawa. The publicity created by the Churchill Avenue closure made some residents dream of creating something similar in Westboro. 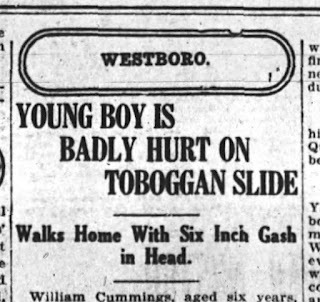 Back to the toboggan hill for Westboro... One well-supported idea was the concept of a full slide that could be built behind Westboro Public School (now the site of Churchill Alternative). That idea got a mention in the newspaper the following Monday morning, and by Christmas, construction was in full progress of a huge slide behind the school. Westboro residents David Latimer and J.A. Leech were behind the endeavour, but it was not just something they were doing for the community; the pair saw this as a money-making business venture. Their plan was to sell season passes for the slide, for $1 per family, which would allow for unlimited use for an entire winter. The slide was twenty-five feet high, and at its peak had a run of over 1,000 feet. There was 225 feet of trestle work that had been built, to accommodate the fairly steep drop off the cliff behind Westboro School. 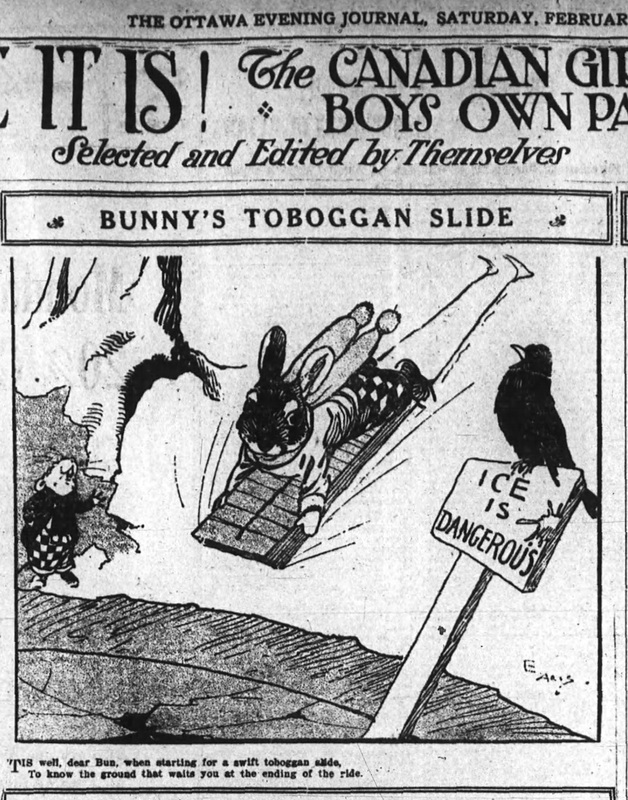 The slide had two sides to it: one that was strictly for toboggans and typically adults and older children; while the other side was for smaller children and/or for the use of sleighs. Electric lighting was installed for the park, and precautions were taken against injury, including "a railing around an iron pump, which was situated close to the runway." Latimer and Leech invested $200 total to constructing the toboggan park, and it was Latimer himself who was to manage the day-to-day operations and maintenance of the slide. The grand opening was held on the evening of New Year's Eve, and over 150 Westboroians were in attendance. For the opening, Latimer had built the run up to a length of 400 feet, 300 of which was iced to ensure speed. 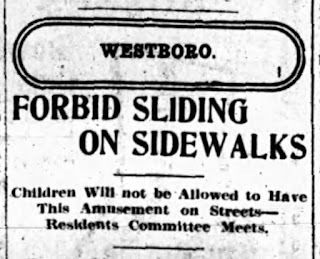 "The introduction of the new source of amusement in Westboro will cause a big impetus to tobogganing in the village and will in all probability attract many city tobogganing enthusiasts", wrote the newspaper of the day. Road at top, streetcar line cutting straight from left to right. areas where Byron would one day exist. 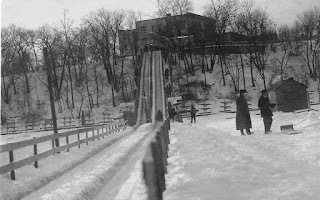 The toboggan run started behind Churchill Alternative, and ran all the way west down the hill and along what is now the newly renamed Lower Byron Avenue, through Roosevelt Avenue, and right to the Highland Park Lawn Bowling Club. The red line on the photo below shows roughly that route. over what is now Roosevelt Avenue. Here is just a close-up view of that dead end of Lower Byron Avenue, where the toboggans ran 104 years ago! where the toboggans ran 104 years ago! A few days after opening, Latimer and Leech had second thoughts about charging for access, after being convinced by the Trustee Board. Instead they were considering allowing Westboro's residents free use of the park once they had recovered their investment. The newspaper wrote that "it would behoove the residents of Westboro to help the good case along and purchase family season tickets at $1 each as soon as possible." The board was unsure if they would allow non-Westboro residents to use the slide for free, if it was to be opened up, and perhaps season tickets would continue to be sold to non-residents, as a way to help cover maintenance costs. 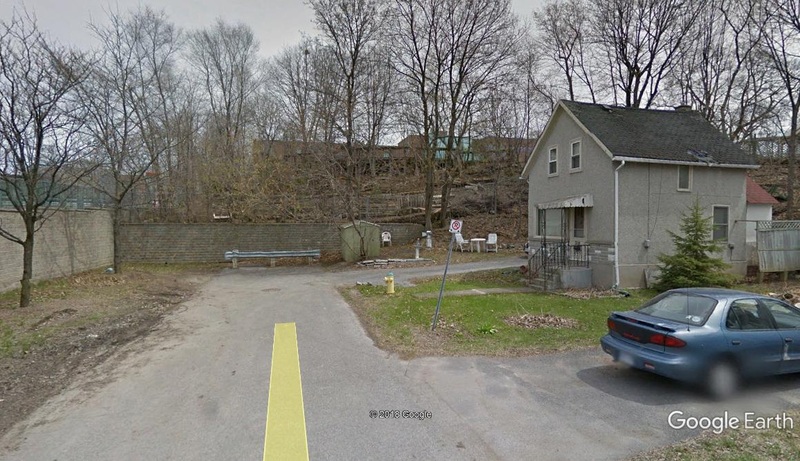 The Trustees interest in seeing the slide opened for free was to help remove the kids from other streets in Westboro. "If we are successful in having the slide thrown open, free of charge to the public, all sliding will be stopped on the streets of the village...would be one of the best moves possible, as it would eliminate any risk of accidents occurring by sliding on the streets, and would tend to provide healthy exercise for both the old and young residents of the village." However a day later, Leech and Latimer announced that it would actually take $300 to open it up for free, to which the Journal wondered whether the proprietors were "holding out" or simply had made an initial miscalculation. By January 8th, nearly 100 season tickets had been sold. The argument was also made that it might not be fair to existing ticket holders that the slide would be opened for free to everyone, with one resident stating that if the slide was opened to the public, then the money should be returned to ticket holders. But that wasn't logical either. A push was on for civic-minded individuals who could afford it, to buy up season tickets so that the park could be free for all, as a benefit to Westboro in general. Stated one resident: "Is it worth the sum of one dollar for yourself and members of your family to use the slide for the entire winter? If it is, it does not matter whether or not the slide is operated by the trustee board or by private individuals.". In mid-January the operators requested a permit from Westboro council to extend the slide even further, which would have required closing the end of a street (Roosevelt). This request was not granted. The council was playing politics with the operators, but at a meeting a few days later, a compromise was reached. The proprietors would allow people to slide during the day for no fee, but that there would be no supervision of the slide during that period, and tobogganers would be sliding at their own risk. Then as of 7 p.m., the slides would be for paid customers only. By mid-February, the slide reached its peak length of nearly a quarter of a mile (well above 1,000 feet long), and had become very popular with locals and city visitors. the time. 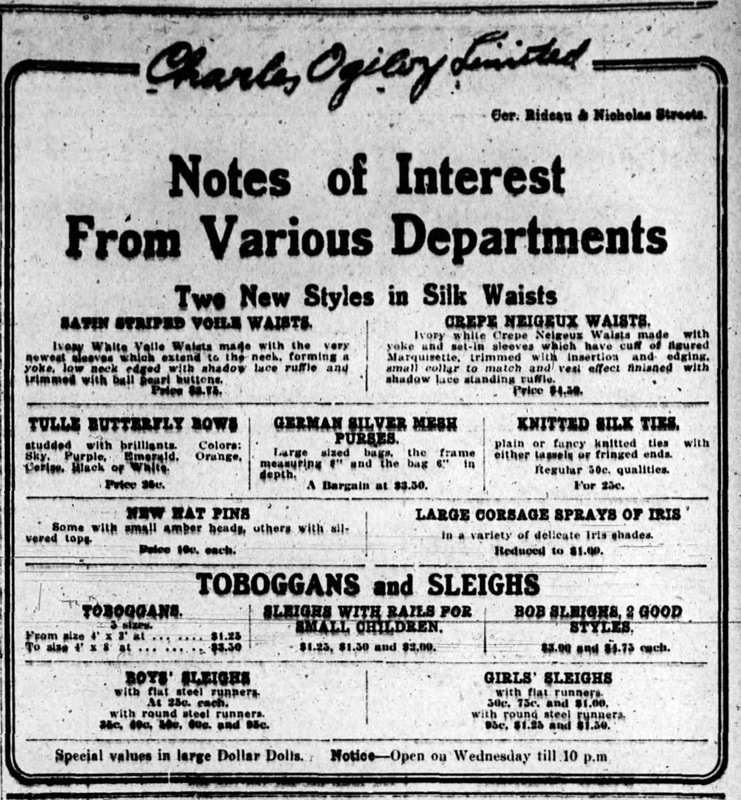 From February 14, 1914. 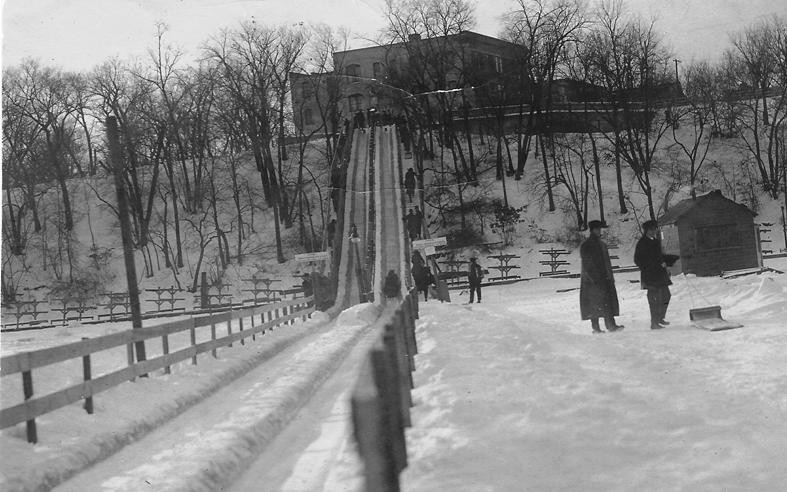 The Westboro Slide became the highlight of the village in the winter of 1914, with many parties, church social events and community events being held at the park. Things seemingly were running smoothly well into late February. However, late in the month, David Latimer installed a chain across the bottom of the fast side of the slide during the daytime to attempt to keep kids from using it. However, this only appeared to add to the fun for the children, who would duck their head at the bottom of the slide to go under the chain. As you may have guessed, on February 25th, William Cummings, a 6-year old boy who lived on Cole Avenue, received a serious head injury when he attempted to duck, and the chain caught his head, opening a large six-inch gash. William was able to walk home on his own, but the Doctor was called in, and his serious cut was taken care of. He remained in bed for several days, recovering slowly. The story made the newspaper the following day, and became a larger story in the days following. 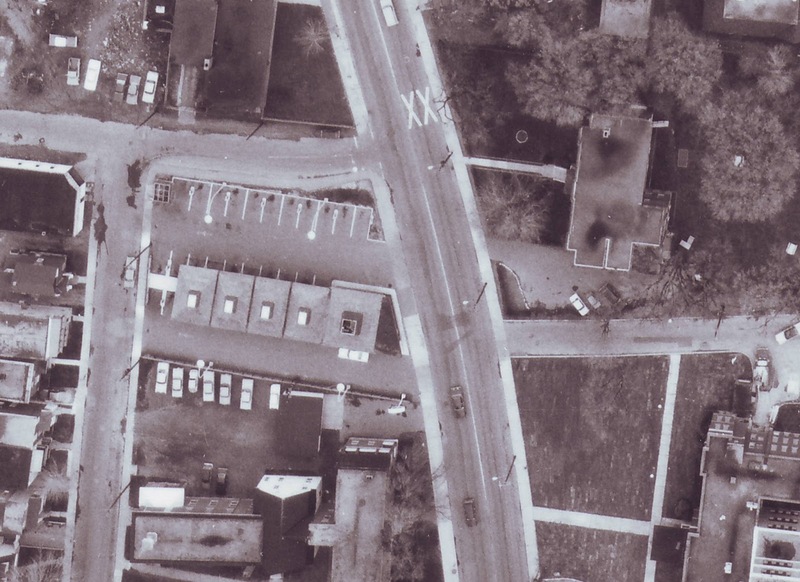 The village trustee board was angry at Latimer's decision, and told him to remove the chain, or they would revoke his permission to have the slide extend across Roosevelt, which would therefore have removed at least a third or more of its length, and greatly affected its popularity. Latimer contended he was within his rights to chain off the fast side, and just allow the children's side to be accessed (free) during the daytime. He claimed that when the agreement was made in January, that it was not stipulated how many runways of the slide would be operated during the day. Latimer was interviewed the afternoon before a town meeting in March, and stated that if both runways were open to the public during the day, that the toboggan (fast) runway would likely not be in good shape for the cash and season-ticket holders for after 7 p.m. Thus the chain was installed to keep people off of it. "The children knew that the chain was there, and that they were not to use the toboggan runway. If they get injured, are we to blame? If they could not swim, and went down to the river and jumped in, would they not expect to get drowned? ", stated Latimer. "I do not feel that I have broken any agreement with the trustee board. The children were to get free sliding for a few hours each day. Instead of giving them only a few hours, I fixed up a good slide for them, and gave it to them free of charge for all the time. The slide has been a big advertisement for Westboro, and I cannot see why the residents of the community or the trustee board should be too hard on me,"
While the issue was being debated, Latimer removed the chain in good faith. At the council meeting on March 5th, the board ordered the chain permanently removed, to allow both sides of the slide to be open. Latimer defended why the injury to Cummings had occurred, claiming that the chain had been moved. "If the chain had been left in its original position then nothing but a toboggan would have hit it. To my mind some person longer headed than the injured boy raised the chain, and it was in a dangerous position when the accident occurred." Likely frustrated with the whole political battle that he had waged all winter, a week later, Latimer decided to end the season, with the last paid slides coming on Thursday March 12th. The weather was beginning to warm up as well. To the end, Latimer claimed he did not remove the chain due to the council's order. "The orders of the trustee board would have been of no use if the slide had remained in operation. 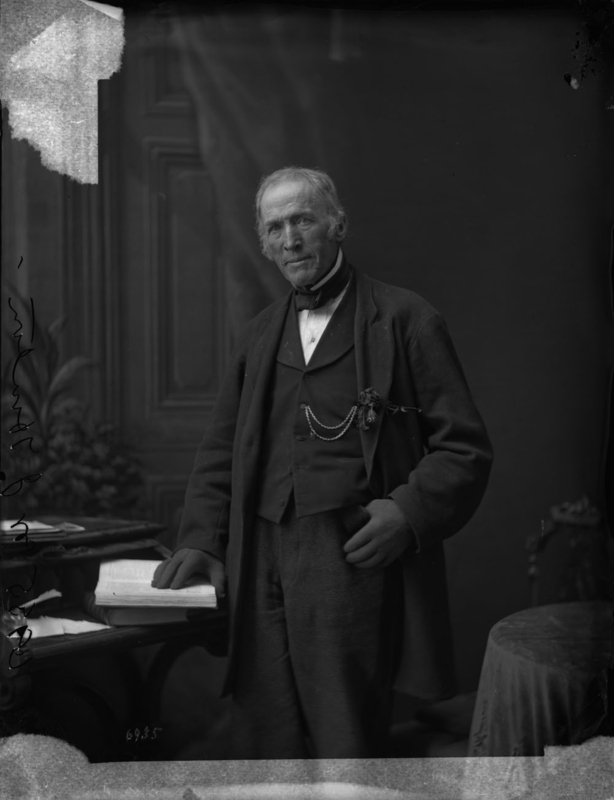 The trustees could not make me remove the chain, and if the slide had remained open, I would have shown them that they had no authority to order the removal of the chain." He claimed he removed the chain because the slide was "becoming useless owing to the mild weather". The slide was left open in an unmaintained state until its natural ending later in March due to the arrival of Spring. In the end, barely $200 was raised by Latimer and his partner Leech, which did not cover the original construction costs and maintenance. The following fall, Latimer opted not to reopen the toboggan run, not worth the hassle, and instead announced in December he was opening a new skating rink. Far easier to maintain, and less controversial! The rink was on Alexandria Avenue, today better known as Berkley Avenue. 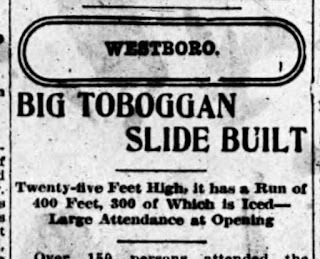 And so ends the story of the exciting, but short-lived Westboro Toboggan park of 1914! This week's new issue of the Kitchissippi Times includes my last part in my profile of the Hinton family. This part of the article talks about the last years of both Joseph and Robert Hinton's lives, as well as more detail on the successes of their immediate family, and their legacy left behind. It has been several years that I've poked away at this article, so it feels great to finally see it in print, and to know I've published about as thorough and detailed a story as I can of this important family. I feel confident that I've exhausted every possible source of information, and included every notable tidbit of information that I can. At minimum, I feel great that I've been able to put a story to the name. Previously there was very, very little detail available on the Hintons, beyond a basic couple of lines, and no photos at all. These articles have generated the most amount of feedback I've had on any topic. I appreciate all of it! 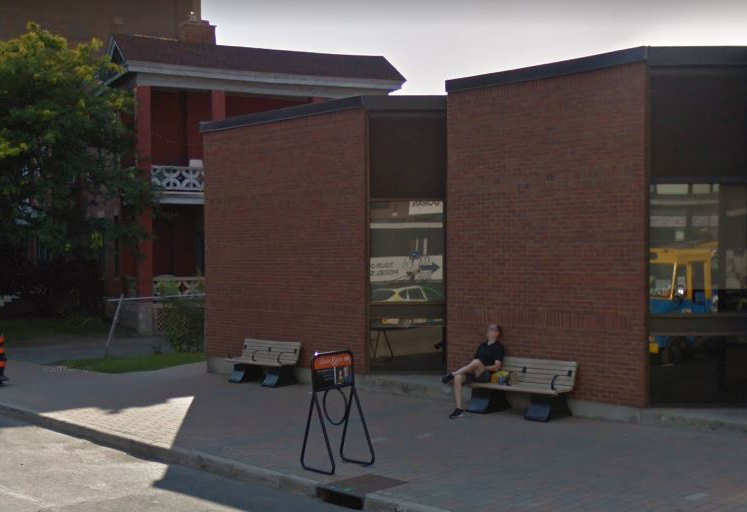 Long-time residents of the area will likely remember with fondness the A&W Drive-In that existed on Wellington Street in Hintonburg for more than a decade. I had certainly heard of it before, but had never seen a photo until recently, when I discovered I owned a couple of photos of it in a large collection of old local photos I acquired a few months back! So a perfect excuse to make a short post to talk about the greatness of A&W. The Hintonburg location was symbolic of A&W's meteoric rise in the 1960s, to its equally as crushing fall in the late 1970s. The A&W was located at the corner of Wellington and McCormick, now the site of the Royal Bank. 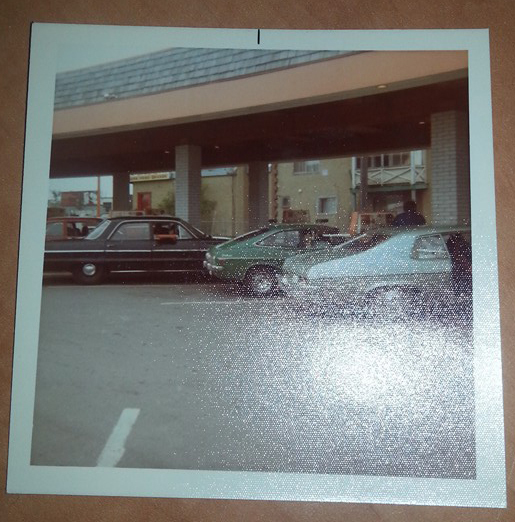 It opened in 1968, was expanded in 1974, and was gone around 1979-1980. Not just A&W as the occupant, but the building itself lasted only 12 or so years. A very brief existence for sure. This corner has a very long and important place in Hintonburg's history, which I have touched on a few times in various articles over the last few years, but it goes all the way back to the early 1890s and the opening of Alex McCormick's grain elevator and mill on this site. It was soon after taken over by one of McCormick's top employees, James Forward, who ran the operation, with a public-facing wholesale and retail flour and feed business, until 1942. Forward being one of Hintonburg's most prominent citizens in its history. That original grain mill structure was demolished, and replaced with a new shop that lasted from 1943 until 1966. This was first known as the "West End Tire and Vulcanizing Shop", and for a while Copeland's Builders Supply (and later McLennan Plumbing and Heating) operated out of an addition at the rear. 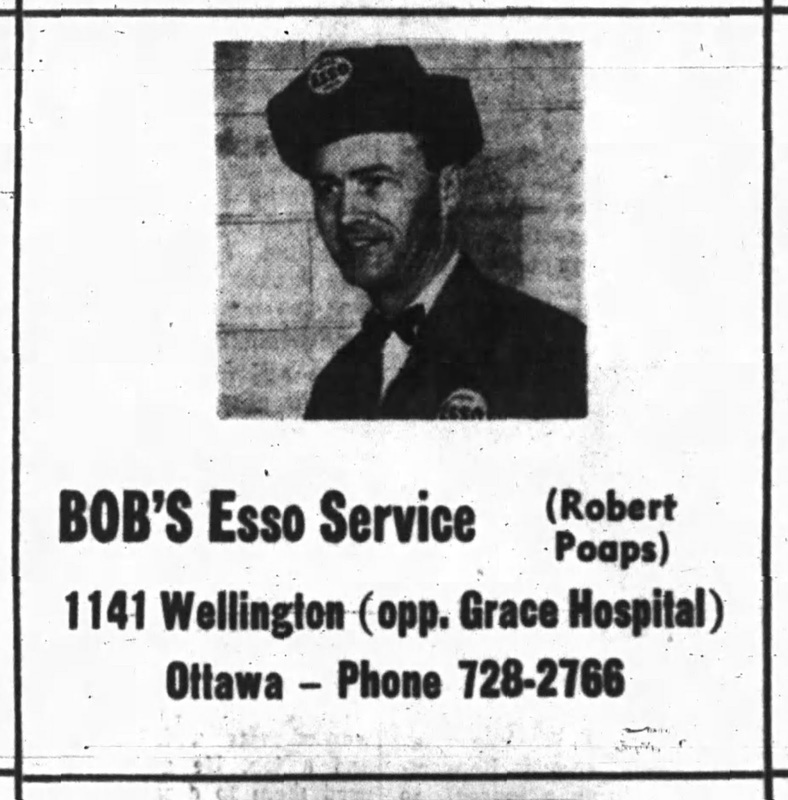 In 1957 it became an Esso Service Station, operated for nearly a decade by Robert Poaps, hence why it was better known as "Bob's Esso". Bob's Esso closed in early 1966, and the empty shop appears to have sat vacant for a year or so, until A&W acquired the lot and built the new restaurant. 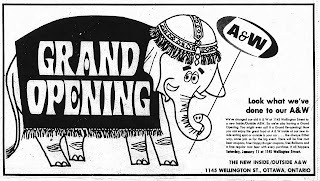 I surprisingly had difficulty finding out exactly when it opened; they seemingly had no ads to promote a grand opening, and I couldn't locate any building permit info. The best I can put it is that it opened somewhere between the fall of 1967 and the summer of 1968. A&W started in the States back in 1919 when Roy Allen opened a root beer stand in Lodi, California. He expanded this into a restaurant in 1923, in Sacramento, with a partner Frank Wright (the W in A&W). 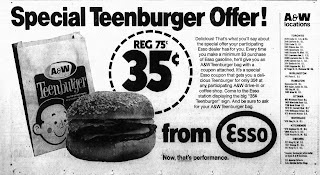 However the focus in the early years was on the root beer product, and less so on the burgers. It was actually A&W in Canada that took the franchise to new levels. The first A&W in Canada opened on Portage Avenue in 1956, and it was in the Canadian market where the food-restaurant focus developed, and it was in Canada where the burger family (papa, mama, teen) originated, later copied by the US version. A&W Canada succeeded on two fronts: a successful family fast food restaurant during the day, and a popular "teenybopper and cruising" spot for the baby-boomer kids in the evening. A&W was at the forefront of the novelty appeal of a "drive-in" restaurant, which became a major trend of the 1960s. Cars and highways had exploded in popularity, and building off this popularity was the idea of dining in your car. Pulling up and having a server come to your car window to take your order (in some cases wearing roller skates, combining another popular 60s fad), then deliver the meal on a tray to your window was a fantastic success. At their peak in the 70s, there were more A&Ws in North America than McDonalds. The fact that an A&W opened in Hintonburg is no surprise. It was the fifth location to open in Ottawa. 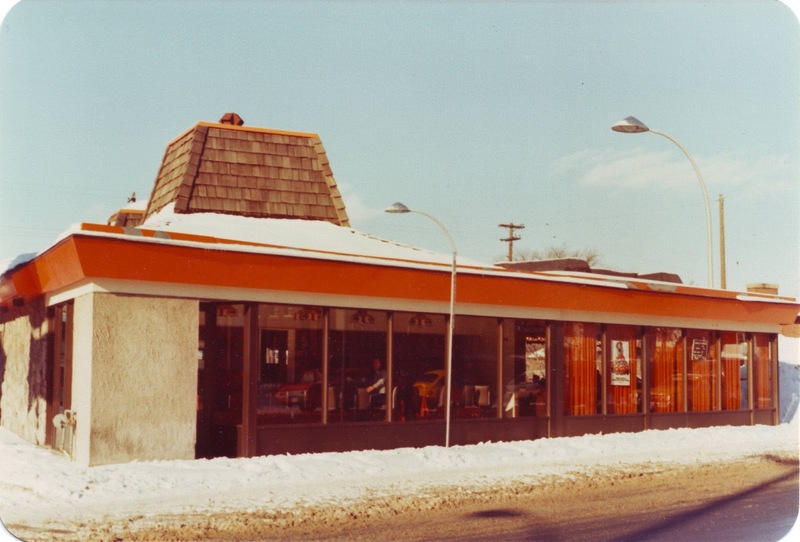 The Hintonburg A&W initially featured drive-in and take-out service only; dine-in service would be added a few years later. 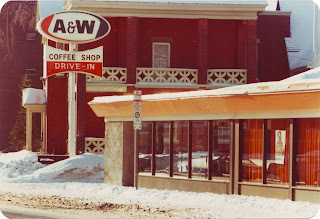 A&W at 1145 Wellington Street West, circa 1978. Google Streetview of the same spot today! Ottawa Journal, March 10, 1967. Ottawa Journal, November 27, 1970. 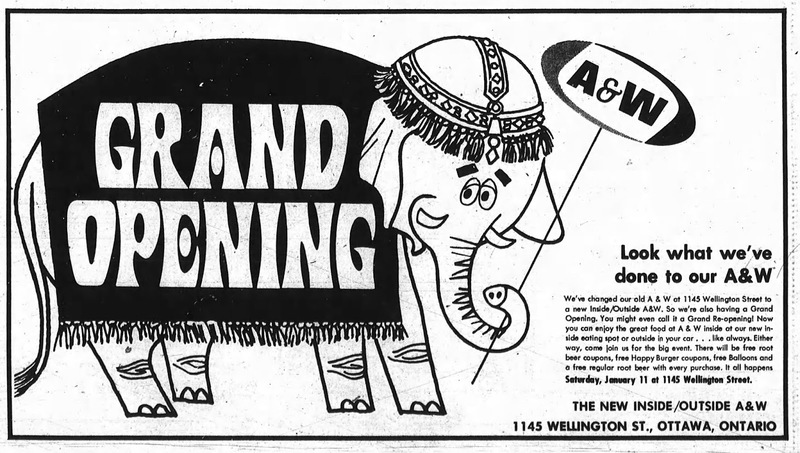 In 1974, the Hintonburg A&W was renovated, to become a new "Inside/Outside A&W". An addition was added to the east side of the building, creating a dine-in section to the restaurant. It had a grant re-opening in early January of 1975. The two aerial photos below show the difference before and after the renovation. A&W is in the centre of the photo, with the four square dots on top of the building. The spacious parking lot is alongside McCormick, and it appears there is something in between the spaces, on the shorter lines? Perhaps some kind of menu stand or a tray holder or ? Also I'm not sure what those two white circles are in the parking lot (they also have an oddly-shaped line running off of them). My guess is overhead lighting? McCormick. A bit of the Grace Hospital at bottom right. As hugely popular as A&W had become in the 60s and early 70s, they declined fast in the mid-to-late 70s. Eating habits changed, and people's habits changed as well. A shift in the industry saw fast food businesses begin offering drive-thru windows. A&W lagged behind the other fast food giants, largely sticking to drive-ins, must to their detriment. In 1975, A&W Canada launched what was originally to be a temporary advertising campaign, featuring a character, The Great Root Bear. The mascot became very popular, and was eventually adopted for A&W in the States as well, and remained for the long haul. One of the few positives in a decade of mis-steps for A&W. A&W Canada's corporate approach changed in 1977-78. The chain decided to franchise all of its restaurants, rather than operate them from a HQ level. The Ottawa locations were the last holdouts nationally, largely because head office was unable to find owners to take over the franchise restaurants. Corporate also shifted their target market at this time to adults. 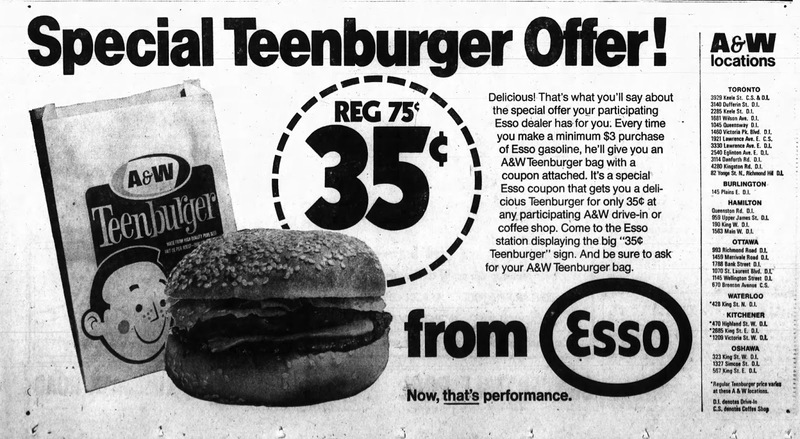 They began redecorating their restaurants and changing menus to "satisfy the growing sophistication of the fast food market", with "plush decor, more sophisticated hamburgers with exotic sauces as well as a range of competitively priced burgers" designed to give A&W a "greater share of the growing adult trade". 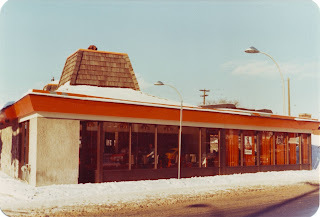 In the summer of 1978, the Merivale Road A&W drive-in location closed (A&W blamed altered traffic patterns), while the Bronson Avenue location closed later that fall (A&W blamed its 24 hour a day schedule), leaving only the Hintonburg and St. Laurent Blvd locations as the last two in Ottawa. The Hintonburg A&W closed sometime in late 1979 or early 1980, and the restaurant was demolished soon after. A&W resurrected operations during the 1980s, by targeting locations in shopping malls (the eat-in restaurant in Carlingwood was a favourite spot of my family's in the 1980s). Drive-in locations were almost fully phased out, the last one of its kind in Canada was closed in 2000, in Langley, B.C. In the last ten years, A&W has made many more changes to appeal to a wider audience, and have now moved into second place behind only McDonald's for locations (there are 900 in Canada now, closing in on McDonald's 1,400). For me personally, it's my fast food of choice, far and away in a different class than the McDonald's and Burger Kings. So there you have it, the story of the relatively short-lived Hintonburg A&W Drive-In! Bonus photo I just found, shared to the Mechanicsville Facebook group, posted by Dan Lacelle in March 2015.